Each American produces more than 1,600 pounds of garbage a year on average according to the U.S. Environmental Protection Agency (EPA). More than half of that trash ends up in landfills where it generates methane, a greenhouse gas that’s over 20 times more potent than carbon dioxide. But instead of being allowed to burn off, or enter the atmosphere where it exacerbates global warming, this methane from waste can be used to produce energy. 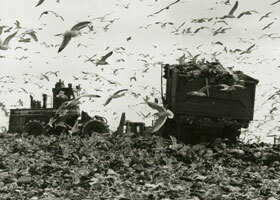 The 2,200-acre Fresh Kills Landfill on Staten Island in New York City was once the largest landfill in the world. 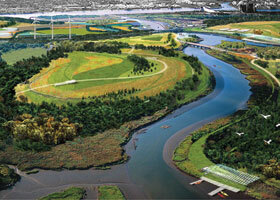 Over the next 30 years, it’s being turned into Freshkills Park—a park three times the size of Central Park. It will be comprised of five different areas for natural landscapes, wildlife, recreation, cultural and waterfront activities, and a 9/11 memorial, and utilize alternative energy sources, grow native greenery for the park on-site and restore wetlands. It is already capturing methane to produce energy. Fresh Kills, which means “Fresh Waters” in Dutch, was an area of fertile coastal marshes and tidal creeks when New Amsterdam was settled. In 1948, it was used as a temporary landfill, but it remained open for 50 years, receiving up to 29,000 tons a day of New York City’s municipal solid waste at its peak in 1986-87. The landfill was scheduled to close December 31, 2001, but after September 11, Ground Zero remains were brought in for sorting and disposal. Afterwards, the city’s ambitious plans to transform the landfill took shape. Today Fresh Kills’ four landfill mounds (45% of the site) are grassy and studded with volunteer trees. The landfill is being covered in phases with multiple protective layers, including an impermeable membrane and several feet of clean soil, to make sure there is no leakage of landfill gas, produced during the decomposition of organic material, or of leachate, contaminated liquid that seeps from landfills. An extensive infrastructure of wells and pipes channels the gas to a purification facility and leachate to an on-site treatment plant. Once, “Fresh Kills emitted more than 15 billion cubic feet of greenhouse and carcinogenic gases a year—almost 2% of all the world’s methane,” wrote Elizabeth Royte in Garbage Land (Little, Brown and Company). Today, it generates 10 million cubic feet of landfill gas daily, which is converted to five million standard cubic feet of high BTU gas that heats 22,000 homes in Staten Island. And New York City receives approximately $11 million a year for the former landfill’s gas. Landfill gas is composed of about 50% methane, 50% CO2 and water vapor, and small amounts of hazardous air pollutants and volatile organic compounds (VOCs). The EPA estimates that for every one million tons of municipal solid waste, 432,000 cubic feet of landfill gas are produced daily. If not controlled and monitored, the gas can migrate under a landfill and cause fires and explosions. Landfills can release methane and CO2 into the atmosphere, exacerbating global warming; They can also emit VOCs that produce ground-level ozone or smog, hazardous pollutants and noxious odors. In 1996, the EPA ordered larger landfills to collect and combust landfill gas by flaring it or installing an energy recovery system. The gas must be monitored while a landfill is active and for 30 years after it closes, according to Chris Godlove of EPA’s Landfill Methane Outreach Program that promotes the recovery of the gas as an energy resource. Landfill gas can be used to produce electricity, steam or heat, and can also be used as an alternative fuel. Energy producing projects that depend on this gas capture 60%-90% of the methane emitted, which both reduces the methane released into the atmosphere and eliminates the CO2 emissions from fossil fuels that would otherwise have been used to generate the energy. U.S. landfills decreased from 8,000 in 1988 to 1,900 in 2009, but the number of landfills collecting landfill gas for energy use is growing. “Between 2000 and 2004, there were 21 to 37 new projects each year. And between 2005 and 2010, there were 30 to 48 each year, so there is definitely an upward trend,” Godlove says. Today, 541 landfills are collecting landfill gas for energy: 364 generate electricity; 104 involve direct use of landfill gas in thermal applications; 26 result in cogeneration, producing electricity and steam or hot water; others involve high BTU and leachate evaporation. In 2010, the Landfill Methane Outreach Program identified 510 additional landfills with the potential to produce enough electricity to power roughly 685,000 homes. Methane from South Carolina’s Palmetto Landfill supplies energy for 25% of a nearby BMW manufacturing plant’s electricity and nearly all of its thermal needs. The Altamont Landfill in California turns its landfill gas into 13,000 gallons of liquid natural gas daily to fuel 300 Waste Management garbage trucks. In Middlesex County, New Jersey, the gas from three landfills is being used to power the county’s wastewater treatment facilities and generate green power. And North Carolina’s Jackson County Green Energy Park uses gas from the old adjacent landfill to provide free fuel for artisan studios—including glass-blowing, blacksmithing and pottery. The most environmentally desirable solution to our garbage glut is zero waste—but 54% of the 243 million tons of trash the U.S. generated in 2009 ended up in landfills even after recycling, composting and combustion. The EPA projects that if we could capture 100% of the methane currently emitted at U.S. landfills for electricity generation, we could reduce our greenhouse gas emissions by 150 million metric tons of CO2 per year. CONTACTS: Freshkills Park; Jackson County Green Energy Park.